I just have to share this strawberry shortcake recipe with you. 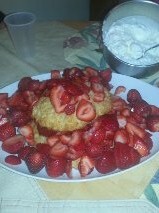 We had it on Father’s Day, gluten free shortcake of course. I am not sure where I got the shortcake recipe; maybe my old Bette Hagman Gourmet Cookbook. It was a big hit with everyone just like in past years. I used to make it a lot when I could still use all purpose flour but my new gf biscuit version is pretty tasty I have to say. 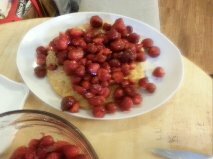 But there is one thing, you gotta make it with the best freaking strawberries you can find. None of those firm ones with whitish cores that are shipped in from far away. You need juicy ripe scented local red berries that can be chopped coarsely and mixed with sugar and served over shortbread. Gluten free short bread. Yes, it can be done and it will taste fantastic! 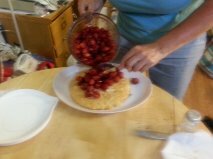 My mom always made a gorgeous version of strawberry shortcake. When I was a kid she would serve it as an entire meal. I have done that and it is kinda cool. 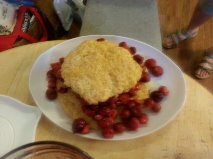 I generally made a huge oval biscuit with a smaller topping biscuit that I split off and buttered the split area before topping with berries and the smaller biscuit. And more ripe berries. Then a topping of softly whipped heavy cream. Oh berry perfection.! Now I do it in two separate pans but the construction of the final dessert product is the same otherwise. I cannot stress enough the importance of the best ripest berries. I got some ripe ones from Lehigh Valley Produce on Main Street in Hellertown. They told me the berries came from Lancaster; Amish country and were not sprayed; smaller and darker than grocery store berries but I must say that the flavor was very good; authentic and so juicy. Perfect for this dessert. Their price per quart was pretty good especially considering the superior quality of their berries. This is not a recipe to make in the fall or winter, it depends on the seasonal ripe local berries for the best flavor. There is nothing much to this but berries and the shortbread biscuit so you darn well better use great fruit or you will not get a good result. 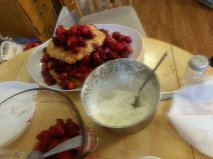 I forgot to take pictures making the shortcake and forgot my camera; my daughter took pictures while I put it together at my mom’s assisted living room so forgive the slightly less than professional look of some of them. Heat oven t0 400 degrees. Mix the dry ingredients in a medium mixing bowl. Cut in the cold butter until it is small pebbles. Add the egg and most of the buttermilk. Mix with a spoon; add rest of buttermilk if you need it. It should be a bit sticky, don’t over mix; just until dry is blended in. Spray the inside of a nine inch cake pan and a 6 inch cake pan with cooking spray. If you don’t have a small pan just use two 9 inch ones. Pat ¾ of the dough into the 9 inch; make it about ¾ to 1 inch thick and try to smooth the top and side edges a bit. Put the rest of the dough in the smaller pan and do the same smoothing. Make that one ½ to ¾ inch thick. Optional: take a tablespoon of granulated sugar and sprinkle it over top of them. Bake them about 20 to 25 min; the smaller one should be done in 20 minutes; a golden light brown. Set on a cooling rack for a few minutes. While it bakes, get the berries ready. Hull 2 quarts of fresh ripe berries. Place them in a glass mixing bowl, chop through them a few strokes with a sharp knife. Add ½ cup sugar and about 2-3 tbsp. Karo light corn syrup to the berries. Stir well and refrigerate until the shortcake is baked. You could do this berry preparation up to two hours in advance. No more or they will start to disintegrate. Place the fairly hot bigger layer on a large platter, one big enough to hold the shortbread and still have room for a generous overflow of strawberries. Butter lightly. Top with several big spoonfuls of berries. Don’t worry if there is juice in the berry bowl; should be; melted down sugar and Karo syrup with berry juice will give you a berry liquid. Top with the second smaller biscuit and then more berries. Cut into chunks. Top with freshly whipped cream; beat a cup of heavy whipping cream until it is softly whipped. Add ½ tsp. vanilla and ¼ cup sugar if you wish it sweet. 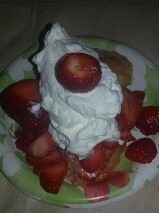 Be sure to pour the berry juice over your shortcake; it soaks in and adds to the strawberry experience. My dad liked to pour unbeaten cream over his shortcake. My mom usually set out the whipped cream, a jug of cream and some whole milk so you could chose how to finish off your personal shortcake. I might add that I grew up on a farm so this was raw milk from grass pastured cows; fantastic cream equaling a freaking perfect shortcake topper. We also grew our own berries; no chemical sprayed on them ever.